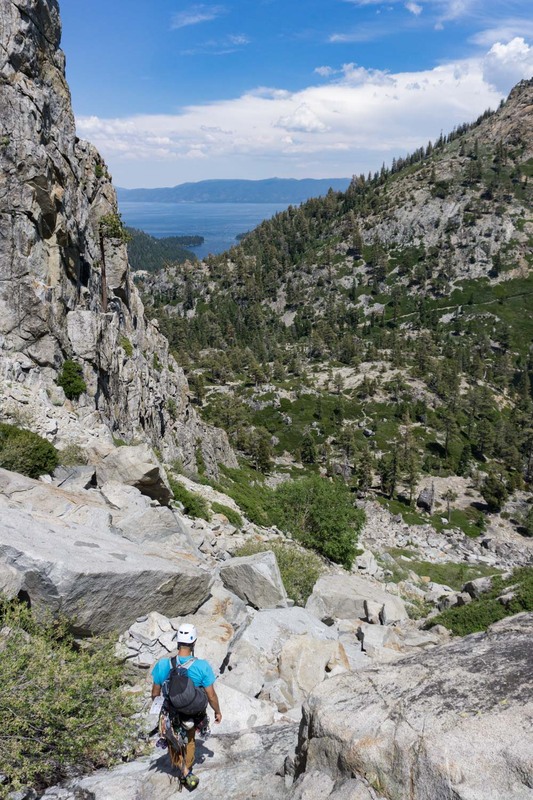 The climb up Eagle Lake Buttress combined with the hike to Eagle Falls/Eagle Lake together make a great day adventure in South/West Lake Tahoe, CA. The Eagle Route in particular is only rated 5.5 and is a really fun climb with an incredible backdrop, and you are more likely to hike/climb with less people around than other more-accessible climbing spots. The scenic drive to the trailhead is one of my favorites in the area. The highway climbs up a ridge and then curves around Emerald Bay with several spots to stop to enjoy the vistas. Park at the Eagle Falls trailhead. You can park in the lot for $5 (or with a visible wilderness permit) or if you get there early you can park in one of the limited number of spots in the roadside lot, or along the road. Get there early on weekends, as this is one of the top hikes and main stops for most West Lake Tahoe visitors. Eagle Falls, one of Tahoe's iconic viewpoints, will be on the opposite side of the highway. When we got back to our car in the afternoon, the highway was backed up with traffic from people waiting for a spot to open up! After heading off on the Eagle Falls trail, be sure to fill out the free wilderness permit form if you're planning to go past Eagle Lake. Very quickly you'll hit the start of the Eagle Falls loop. We headed to the left towards the falls, and after climbing up some granite steps, the rushing falls came into view. The trail continues climbing upstream, eventually hitting a fork that branches off to the left to head to Velma Lakes. We stayed to the right to continue to Eagle Lake. Only a mile from the trailhead, the lake makes a great place to hangout on a warm summer day. The water rushing at the mouth of the outlet was too swift and strong for us to feel comfortable crossing, so we headed down the river until some logs and boulders made a safe enough crossing. From here it was all backcountry route-finding up to the base of Eagle Lake Buttress. Looking up towards the mountain, between the talus field on the left and the slabs towards the right, we opted to tackle the talus fields and boulder hop our way up the mountain. It was a steep exposed climb, and once sun rose above the ridge, we would be in the constant sun for the rest of the day. We had to turn around and backtrack a couple times when the bushes became too thick to cross, but towards the top of the first gully we spotted an incredible ice cave! From the stream crossing, it took us about 50 minutes to reach the top of the ridge. Following the ridge towards the prominent peak, we had to cross a couple of icy snow banks before reaching the base - the end of our hike and the start of the climb. The climb itself was a lot of fun, with the first pitch being my favorite with nice options for some stemming, nice knobby holds, and even some cracks perfectly-sized for hand jams. The second pitch was at a lower angle and therefore easier, and the final short pitch up to the very summit had a 1-2 slightly more challenging moves. The entire route is trad, and there are lots of options to place gear just about everywhere along the climb. The views from the top were incredible with 360 degree views of Lake Tahoe, Emerald Bay, Eagle Lake and two of the Velma Lakes, all nestled under snow capped mountains. We chilled at the peak for a while, eating and relaxing before down-climbing off the back. Once carefully finding our way off the pinnacle, we followed a similar route back, heading down the ridge and then down the same talus field before reaching the lake. All in all, it was an 8 hour leisurely day of hiking, climbing, and soaking in the alpine views. We really enjoyed Eagle Lake Buttress for the fun mountaineering aspect it took to get to the climb, the availability of good quality beginner trad routes, and the general remote feel of the area.